For the past couple years, I have been working on a curriculum for my Photography and Healing theory. This theory, which has been brewing for MANY years, is that photography can be used as a tool to improve our well-being and increase our awareness. I like to think of it as Photography and the Art of Healing. This particular journey began when my kids were little and I got my first digital camera. I realized that photography was a creative outlet for me that brought me joy and helped to change my perspective on things. Over time, I had more experiences with photography that elicited more opportunities to change the way I thought and felt about myself and life. Some of the “assignments” came from friends, some from formal photography classes, other are straight from my own heart. My first session this spring turned out great. Although, there were only 2 people, this small number allowed for an intimate exchange of ideas, stories, and mutual support. Now I am heading into my second session with much more confidence and excitement. I know my class/theory works and helps people, all while having fun and making friends. If you, or someone you know, would like to join me for this new session, you can go to Acton Boxboro Community Education and go to the Summer 2015 catalog. 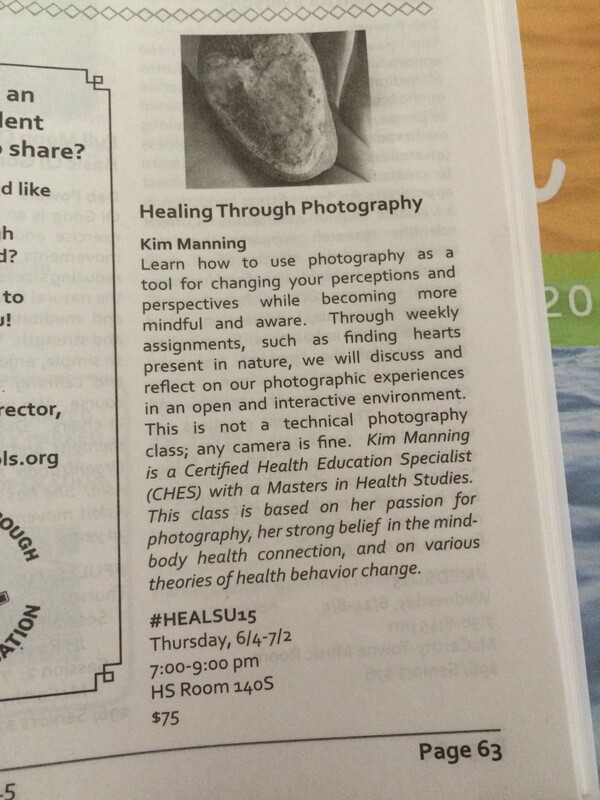 My class, “Healing Through Photography”, is on page 63. I am also more than happy to teach this class in other locations. Please fill out a contact form on my Contact page to start this discussion. PS: I am planning on offering an online version but still working out the kinks.